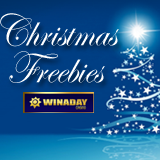 With VIP bonuses this week and a $15 freebie for everyone next week, Christmas has come just a little bit early at WinADay Casino! Next week, everyone can get a $15 freebie to play any slot game or keno. For VIP players there are even bigger freebies with lower wagering requirements and higher maximum cash outs. These no-deposit casino bonuses may be used to play any slots or keno game. Valid December 19 – 26 only. With a minimum $25 deposit, players will receive an extra 50%. Coupon code XMAS can be used up to three times per day. 80% extra will be added to deposits over $30 up to twice a day (XMAS80). Players depositing $35 or more can claim a 200% deposit bonus (bonus code XMAS200) or a 100% deposit bonus with a lower wagering requirement (bonus code XMAS100). Deposit bonuses may be used for any slots or keno games and are valid December 19 – 26 only. Anyone can become a WinADay VIP player and earn extra bonus money. The VIP program has 4 levels: Bronze, Silver, Gold and Platinum with increased benefits at each level. VIPs get free bonus offers when they reach each level, extra bonus percentages on regular promos and exclusive VIP offers. VIP Christmas bonuses begin this week. Anyone can become a WinADay VIP player and earn extra bonus money. Until Saturday, VIP players can get 60% to 150% extra added to their deposits. 100% and 150% match bonuses valid for slots and keno only. VIP bonuses are available only until Saturday, December 17. WinADay Casino has 34 premium slots and 18 penny slots – unique games that can only be found at WinADay. With four new video poker games added this fall as well as Keno and Roulette, there are now 66 real money online casino games at the unique online casino.